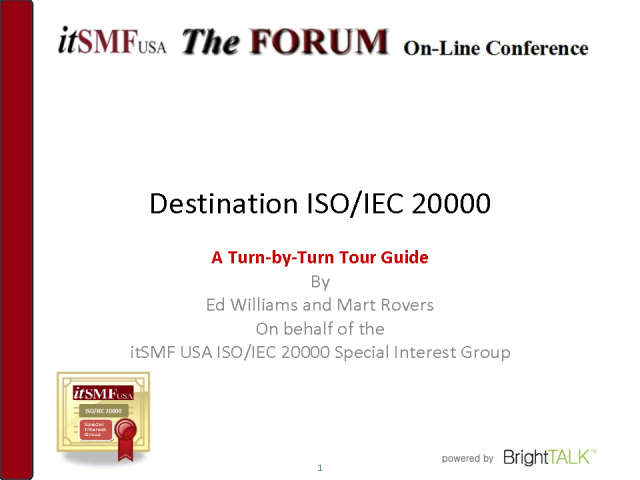 ISO/IEC 20000 SIG will announce its webinar program for the next 18 months. The program will address every phase of reaching the ISO/IEC 20000 destiny. Every two months the SIG will address another phase of becoming ISO/IEC 20000 certified. It is the SIG’s intention to have practitioners conduct the webinars, accompanied with a Subject Matter Expert (SME). If one of the topics appeals to you, either as a practitioner or as a SME, then please let us know by contacting our membership chair Lori Smiley (lori.smiley@nashville.gov), and we will reserve a seat for you!